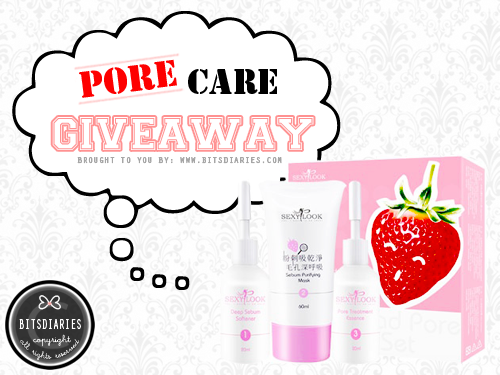 Do you have dull and imperfection skin? Are you looking for a foundation that provides good coverage with a natural, glowing finish? If yes, you gotta read this! 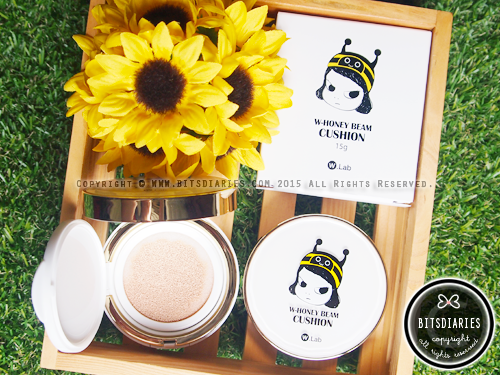 Introducing W.Lab's W-HONEY BEAM CUSHION~! Have you heard of the brand, "W.Lab"? 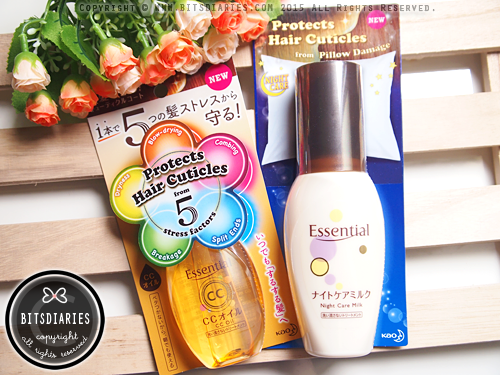 I hadn't until a few weeks ago, I was introduced to this brand by Q-DEPOT and was thrilled to be given the opportunity to try out "W-Honey Beam Cushion", which is one of the W.Lab's best-selling products! If you are new to this brand, let me have a short introduction before I proceed on to the review of the cushion. W.Lab is a Korean brand and it offers cosmetics and various skin care solutions to address to different skin concerns. W.Lab commits to develop best quality products to keep up customer satisfaction and to ensure safety by using only natural ingredients (e.g. naturally derived extracts such as plant extracts, honey) without unnecessary chemical ingredients. And because of their commitments to customer satisfaction and innovation, they have been awarded awards which include the Premium Brand Award in Year 2014, Korea Satisfaction Consumer Index and Korea Customer Satisfaction Brand Award in Year 2015. 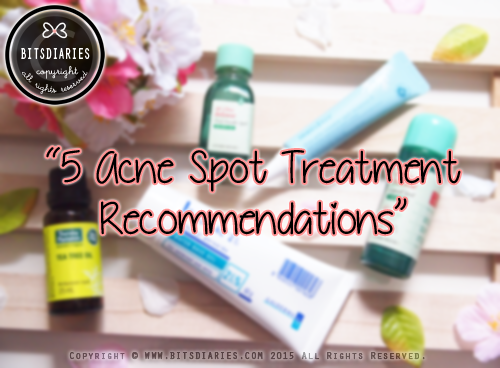 A few months ago, I shared my "5 Acne Spot Treatment Recommendations". 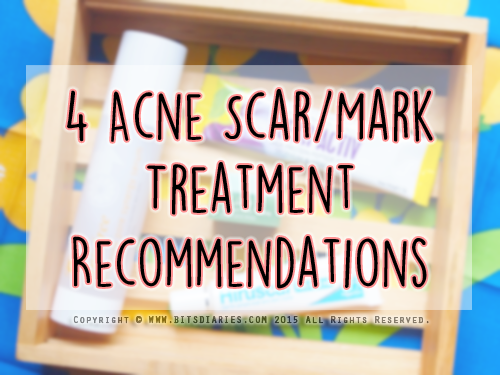 Today, I'm going to share my top four picks that I tried and are truly effective in fading post acne marks and scars. the No. 1 Hydrogel Mask Brand in Korea! Ever heard of this brand? Yes? No? 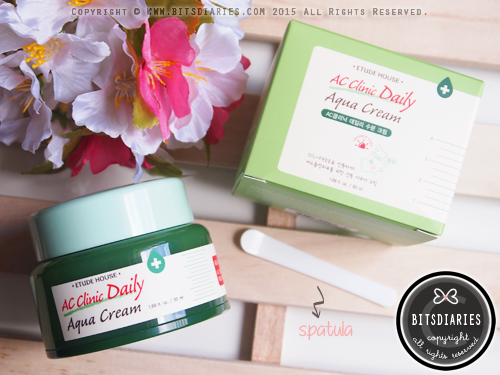 Well, you might be familiar with this brand if you've watched "Get It Beauty" — a popular Korean TV show that talks all about beauty, as it was featured in one of the episodes in Year 2012. For those who are new to "Faith in Face", let me give you some insight on the brand. 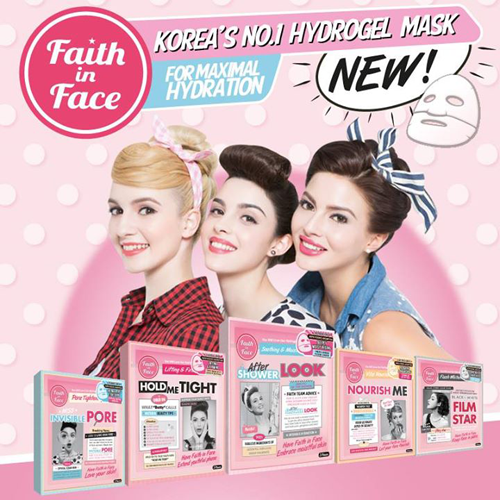 Faith in Face was first launched in 2012 by a multi-national team of young cosmetic experts from Korea, Britain and Canada after 3 years of research and development. The Faith team believes that the role of cosmetics is to reveal and highlight each individual’s true and unique beauty, rather than changing something to your face. With the faith that everyone is born with an attractive and beautiful face, the Faith team strongly believes in original beauty and goes by their motto of “Have Faith in Face, Origin of Beauty”. Faith in Face believes in using only organic and naturally derived extracts, such as vegetable collagen, essential oils, Vitamin E, Hyaluronic Acid etc. 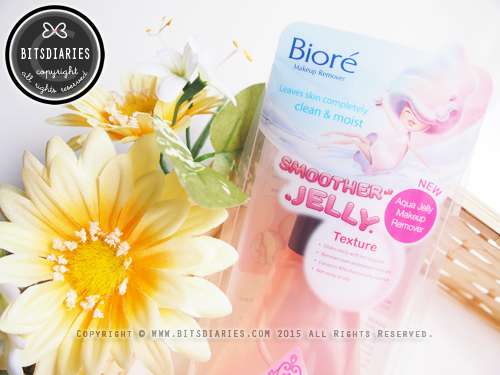 No added paraben and mineral oil. Free of animal testing! Faith in Face products are specially formulated to be gentle on the skin while reducing the chances of allergic reactions. October has gone, and that means it's time for a haul. For the past one month, I spent my money more on supplements that boost beauty and health from the inside out as well as fashion items rather than on skin care and make-up products. 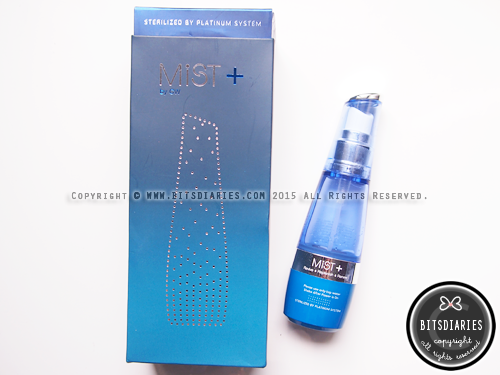 a beauty gadget called "MIST+"~! It's basically a device that creates richly oxygenated ultra-fine mist particles that gently penetrate deeply into pores to cleanse and hydrate skin. Furthermore, the bottle comes with a magnetic lid that can be used as a massager. It claims to give therapeutic effect that helps to improve circulation and reduce inflammation and scarring. Notice: As mentioned in one of last week's posts, there will be some delay in responding to all enquiries received via email, ask.fm and line. I apologize to the readers who have sent in questions/messages to any of the mentioned platforms. Please be patient... :x ; I will try my best to reply to all enquiries by 13th November. 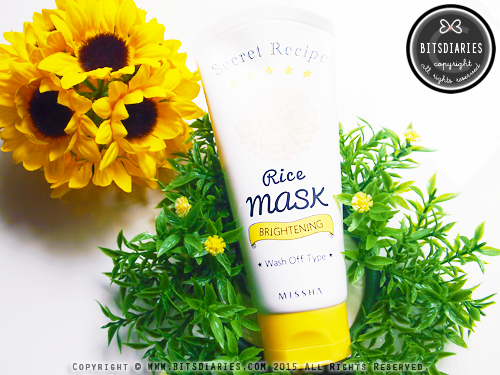 Today I will be writing a review on the Missha Secret Recipe Brightening Rice Mask, which was sent to me for review purposes by Q-DEPOT. However, all thoughts expressed are my own. Missha Secret Recipe Brightening Rice Mask is a wash-off type face mask that is infused with 15% vitamin-rich Rice Water Extract to nourish the skin for a clearer and brighter complexion. Combined with other natural ingredients extracted from Peony, Lily Magnolia, Lily of the Valley and Madonna Lily Flower, it helps to achieve fresh and healthy skin. 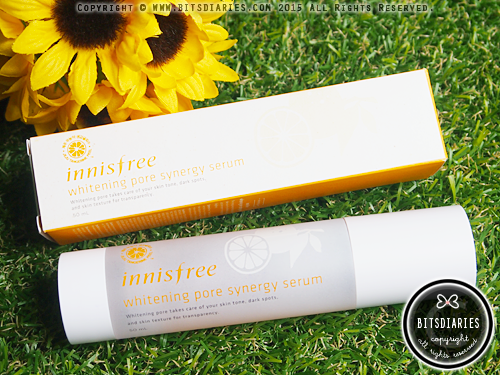 Innisfree Whitening Pore Synergy Serum is an ampoule-essence combination serum that brightens dull and uneven skin tone, diminishes dark spots by inhibiting melanin creation to deliver a clear, fairer complexion. It also helps to smooth skin texture and tighten pores. It is formulated with concentrated tangerine essence, containing 6 types of citrus flavonoids, extracted from fresh tangerine peel from Jeju Island. Fun Fact: Vitamin C included in Jeju tangerines has powerful antioxidants and moisturizing effects. 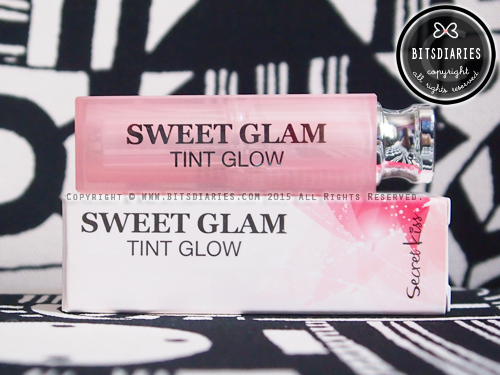 It offers outstanding whitening effects for clear and brighter skin. It has a 5-free system: NO Paraben, Animal Ingredients, Mineral Oil, Imidazolidinyl-urea, Artificial Scent. 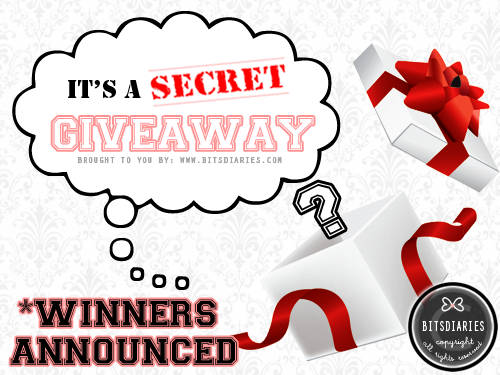 First of all, thank you to all who have participated in the "Secret Giveaway" event. As always, winners will be picked via "Random Line Picker" from Text Mechanic. Have you ever wondered why you are still prone to breakout, even though you have been extra diligent in choosing your skincare/makeup products? Last week, I mentioned about the external and internal factors could be the reasons that lead to your breakouts — "Clear Acne From The Inside Out". 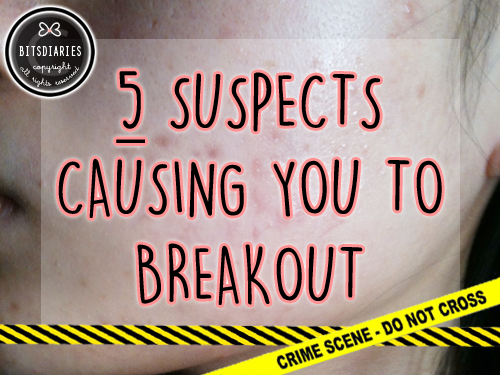 Apart from that, there are things we come in contact with on a daily basis could also be the culprits behind your breakouts. I have nabbed a few suspects, so let's start the investigation! In today's modern world, we are all exposed to electronic devices (e.g. computers, smartphones, tablets, TV) everyday. But... did you know free radicals and environmental exposures, such as blue light and ultraviolet rays from your electronic devices and the sun, can damage your eyes? It can lead to premature macular degeneration and other eye discomforts such as chronic dryness and red veins. 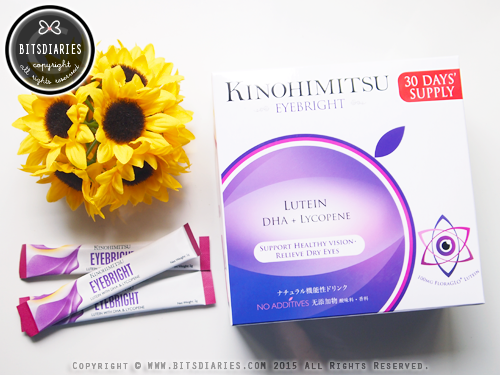 Good news is that you can reduce the damage, protect and improve the health of your eyes with Kinohimitsu EyeBright! Kinohimitsu EyeBright is designed to offer in depth protective elements to the eyes. Coupled with FloraGLO Lutein, DHA, Lycopene and potent anthocyanins (Maqui Berry Extract and Purple Rice Extract) for ultimate nourishment to the eyes. It effectively alleviates eye fatigue, dryness and also promotes focusing. Essential CC Oil & Night Care Milk! We often style our hair using heat styling methods such as hairdryers, straighteners and curlers or chemical processes such as dyeing, rebonding and perming. We do all sort of things to our hair to make it look nice, but did you know that all of these actions can stress and damage our hair? Well, if you don't, now you know! Even seemingly innocuous things like combing, twirling and tying our hair (simple ponytails or braids) can lead to damage. And who are behind all these? 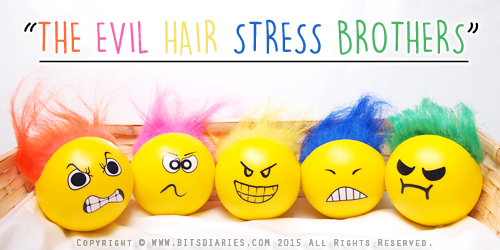 The FIVE EVIL HAIR STRESS BROTHERS! They use their super powers to create stress for our hair, so that our hair will look like theirs — fried, damaged and tangled. 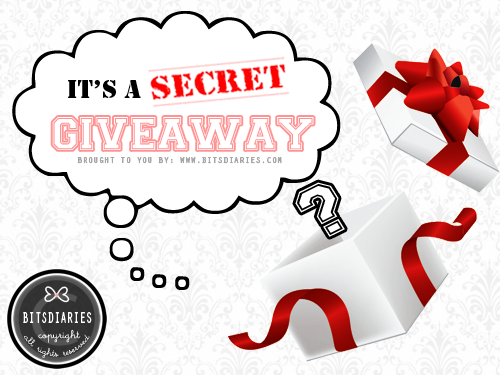 It's been a long time since I last did a giveaway... I haven't done one for this year, and there's a reason behind it. 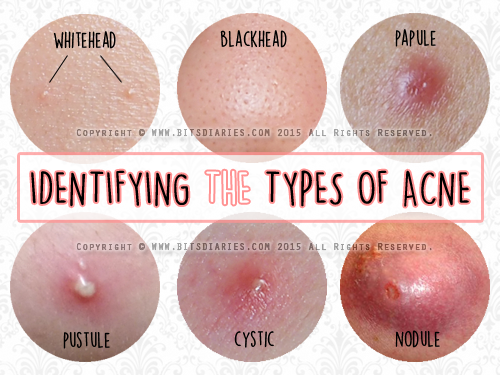 There are many different types of acne ranging in severity from mild to severe. 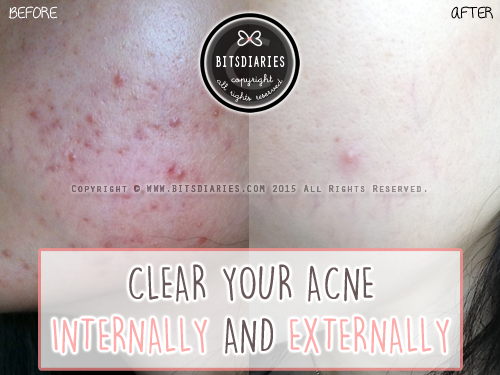 So in order to treat your acne, you must first identify the zit that you are dealing with. Credit: I do not own the picture of nodule. I found it on google. But the rest are mine! "Acne Vulgaris", commonly known as pimples, occur when facial oil, also called sebum, and dead skin cells clog the skin's pores. Once the pores are clogged, pimples start forming and attract bacteria, leading to inflammation. Check out my personal experience with acne — "My Acne Story". A pimple outbreak can be caused by internal and external factors, and the key to clear complexion is to take steps both internally and externally. 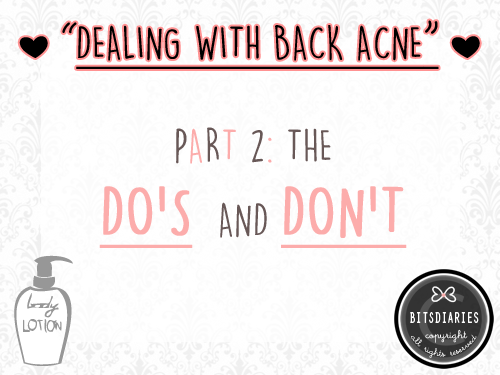 Here are some rules that I abide by which helped me in getting rid of my acne. 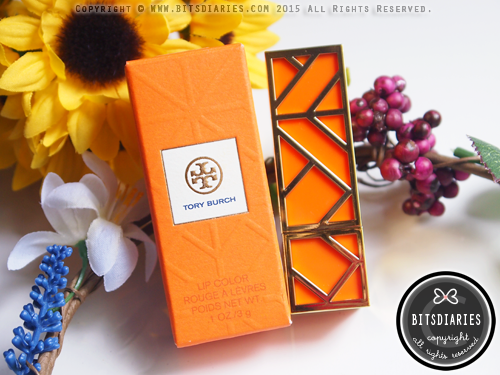 Today's post is going to be a review of the Tory Burch Lip Color lipstick. The Tory Burch Lip Color range has 12 distinctive shades — each designed to flatter a variety of skin tones. Extending from the original signature lip color, Pas du Tout, the collection ranges from tomboy neutrals to feminine pinks and bold brights. This modern formula represents the ideal balance of sheer yet vivid color and rich texture with a weightless finish. 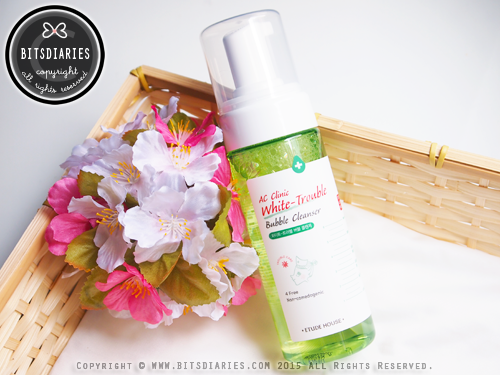 At a reader's request, I will be posting a review on the Etude House AC Clinic White-Trouble Bubble Cleanser. This is a bubble-type foam cleanser; with its rich creamy foam and micro bubble particles, it deeply cleanses the pores, melting down impurities and skin trouble inducing substances. It also helps to regulate PH balancing and protect skin from harmful environment. - Propolis Extract gives an anti-bacterial effect and supplies nutrients to dehydrated skin, as well as helps to revitalize it. - Pine Resin protects skin from external damage. It also helps to moisturize skin and improve skin texture. - Natural Herbal Complex contains Tussilago Farfara (Coltsfoot) Flower, Asparagus Cochinchinensis Root and Laminaria Japonica extracts that provides antioxidant effect and helps to relieve skin troubles and irritation. Hello everyone~! It's time for a HAUL post~! Let's see what I've purchased for the past two months. P.S: Words in blue are attached with a link to my review. If you are interested to know more about the product, click on it. For those in black and without a link, I'll be doing a review in the future. Be sure to stay tuned to my blog. The Innisfree No-Sebum Blur Primer and Blur Pact have become my favorite makeup products. The primer does a good job in controlling sebum, while the pact is really good at blurring the appearance of pores. They both work well together. For more info, click on the blue links above to read my reviews. Finally got my hands on the Magic Any Cushion~! I have been wanting to try it after reading many good things about it. I will post a review once I have tried it for at least a month. 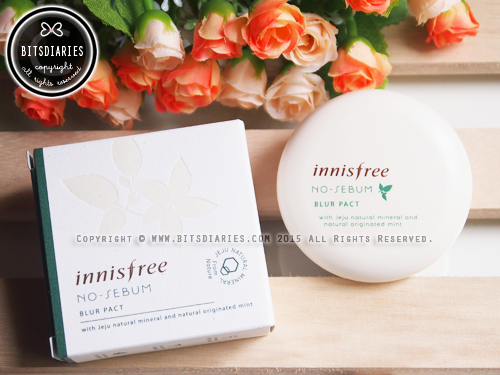 Previously, I did a review on the Innisfree No-Sebum Blur Pact - if you haven't read it, click to check it out! And today, let's talk about the Innisfree No-Sebum Blur Primer — a primer that is designed to control sebum, cover pores and fine lines, leaving the skin with a smooth texture and bright complexion. - smoothes out uneven pores and fine wrinkles, achieving a clear and smoother skin. - contains natural minerals from Jeju and natural originated mint to control the oil-moisture balance of the skin, allowing the skin to remain soft and smooth, as well as allowing makeup to last longer. 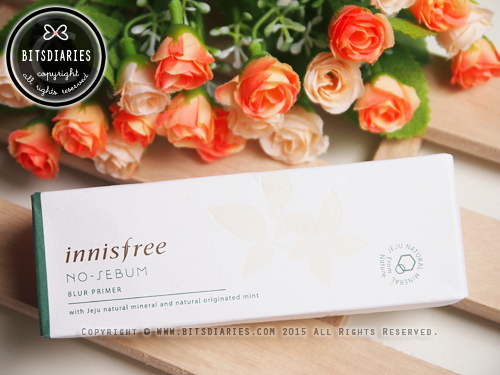 Today, I will be doing a review on a new product from Innisfree called the "No-Sebum Blur Pact". 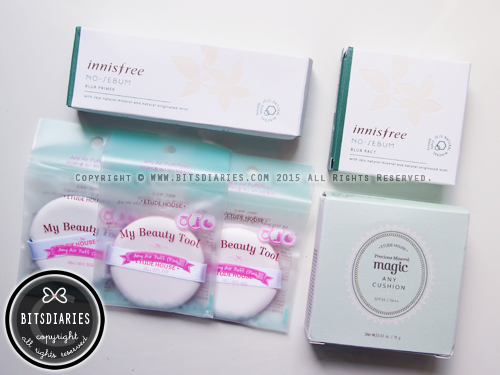 Last year, I did a review on Innisfree No-Sebum Mineral Pact and I'm sure most of you readers are familiar with that product. So similar to No-Sebum Mineral Pact, this No-Sebum Blur Pact is also a compact finishing powder designed to control sebum; but this creates a smooth and radiant skin texture with pore blurring effect. - covers unevenness caused by pores and fine lines for a smooth and radiant skin texture. - contains natural minerals from Jeju and natural originated mint to control the oil-moisture balance of the skin and make it more healthier-looking. 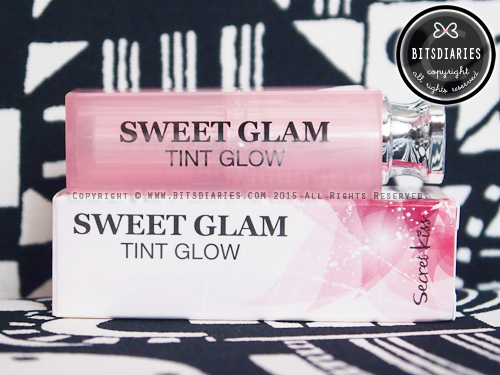 - comes in natural shade that provides a natural look and suited for all skin tones. 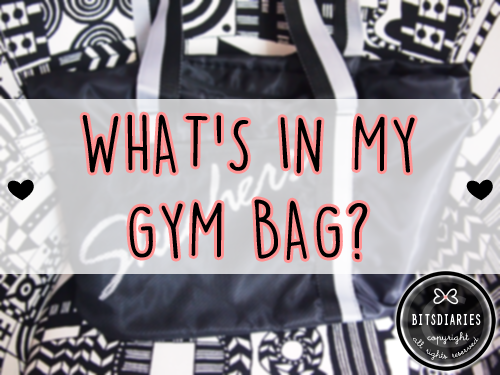 "WHAT'S IN MY GYM BAG"~! P.S. : This is a requested post, which I have delayed for four+ months. 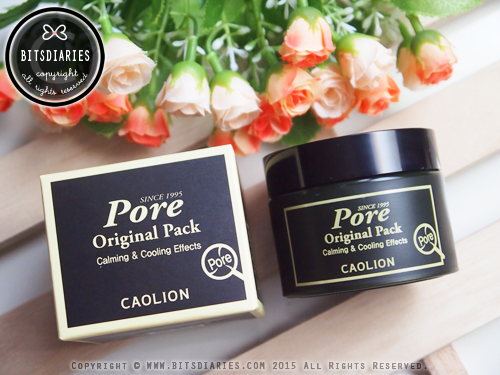 Caolion Pore Original Pack is a pore minimizing mask that tightens sagging and enlarged pores. It also controls sebum and improves overall skin's complexion. - Alaskan Glacial Water (0% regular distilled water) gives a refreshing cooling effects and enhanced pore tightening. 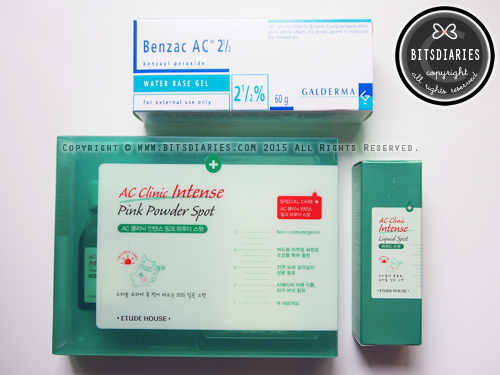 - Glacier Clay absorbs and draws away dead skin cells for translucent and clarified skin. - Charcoal Powder that whisks away impurities, absorbs excess sebum and controls shine and grime. - Panthenol (Vitamin B5) reinforces nature skin barrier. - Hyaluronic acid creates long-lasting moisture barrier, leaving skin hydrated, supple and soft. - Natural humectant retaining moisture, preventing the mask from cracking during drying. Skin irritation and allergy caused by products are often difficult to tell apart because they have similar symptoms — itchy, red, bumpy, rashes. They can occur on all skin types, especially sensitive skin. 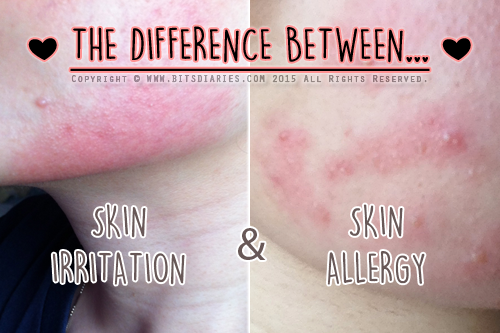 Over the course of my acne journey, I had experienced both skin irritation and allergy for quite a number of times, so I kind of know how to differentiate them. Today, let me briefly show you how you can tell them apart and I will also share some tips on what you should do. Take note that what I'm going to share are not professional advices; they are solely based on my experiences and opinions. Acne is a very common skin problem faced by many people and it occurs when the pores in the skin become clogged by dead skin cells, oil and dirt. It does not only appears on your face, it can grow on your body as well. 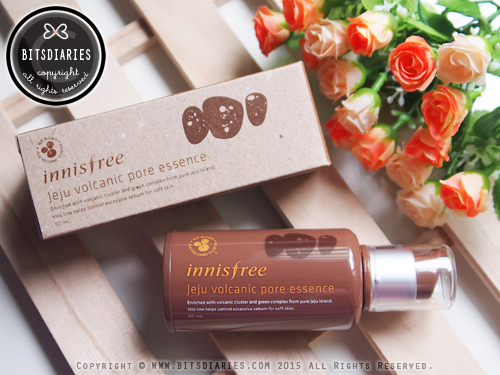 Innisfree has recently unveiled a range of new additions to its Jeju Volcanic skin care line called the "Volcanic Clay Mousse"! I have here with me one of the additions — "Super Volcanic Clay Mousse Mask"! 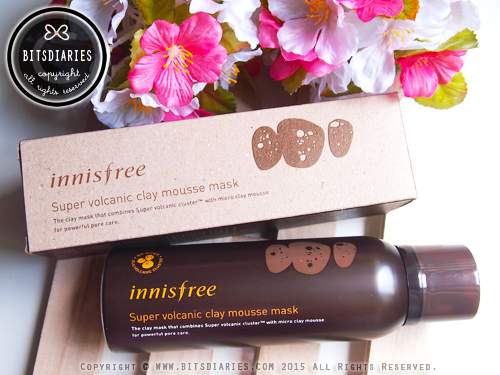 A new mousse formula clay mask that contains 6020mg super volcanic scoria. With innovative technology, the micro-clay mousse molecules are created to be smaller than our pores. As a result, it works it's way into hard-to-reach, tiniest and deepest pores powerfully absorbs sebum, removes dirts and eliminates various pore concerns. Fun Fact: Volcanic scoria is a rare and natural ingredient created from lava that solidified when volcanoes last erupted on Jeju island. With its porous structure full of microscopic pits, it has stronger sebum and body-waste absorptive power. 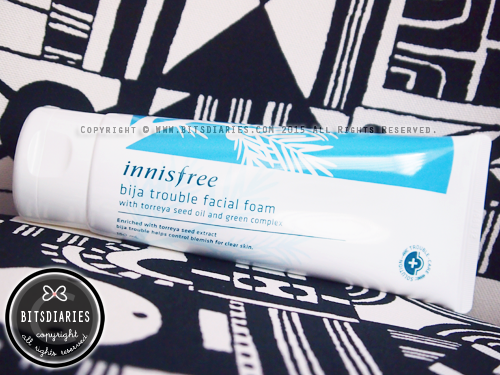 Innisfree Jeju Bija Anti-Trouble Facial Foam is a refreshing cleanser formulated with salicylic acid and *nutmeg fruits, which have powerful anti-inflammatory and antibacterial properties. Combined with torreya seed oil which has an outstanding healing effect, it provides an effective relief for skin troubles. *Fun Fact: The nutmeg is a rare ingredient that has endured 20 years of survival in the wild. It smoothes your skin and enhance the skin’s natural defense system. The most effective way to get rid of a pimple quick is to use a spot zapper. A spot zapper is a targeted pimple treatment that usually contains active acne ingredient such as salicylic acid, benzoyl peroxide or tea tree oil, to calm inflammation and heal pimple. P.S: If you want to know more about the mentioned active acne ingredients, read my article on "Understanding The Acne Fighters". Note: All information written and shared in this article are based on my knowledge and experience. Acne products are formulated with different types of active acne ingredients (= the fighters) and they work differently to fight acne. 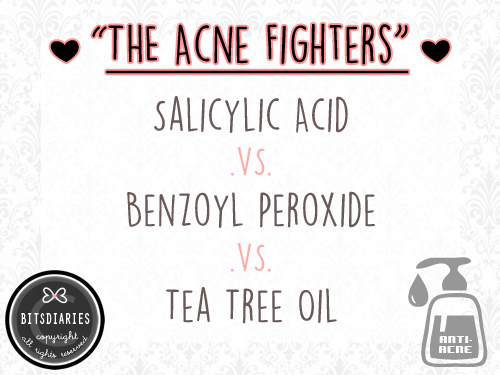 Therefore, when it comes to choosing an acne fighter for your skin, it is very important to know what each of them does. The most frequently used active acne ingredients in over-the-counter acne products are Salicylic Acid, Benzoyl Peroxide and Tea Tree Oil. 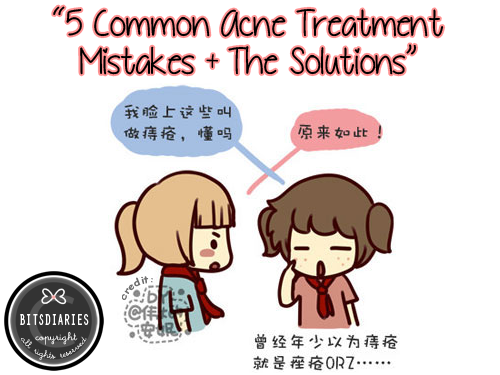 Here are the FIVE common acne treatment mistakes that are making your acne worse and FIVE solutions to correct them. 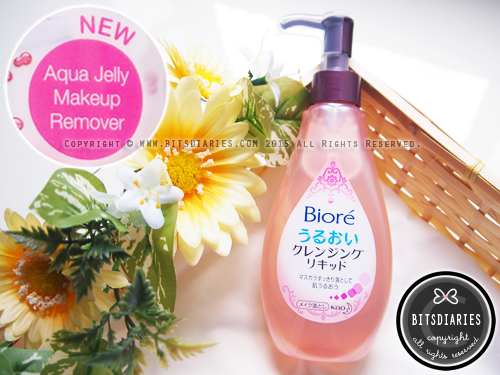 Biore Aqua Jelly Makeup Remover, a product which I have been using since Year 2013, has a NEW and IMPROVED formula! Each bottle weighs 230ml. 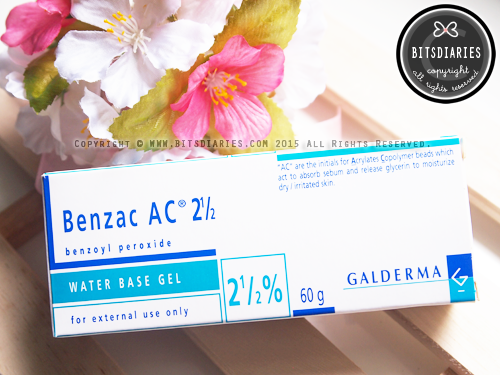 Benzac AC Gel is an acne spot treatment formulated with active acne ingredient, Benzoyl Peroxide, that unblocks pores with a mild peeling effect and clears pimples and blackheads without drying skin. 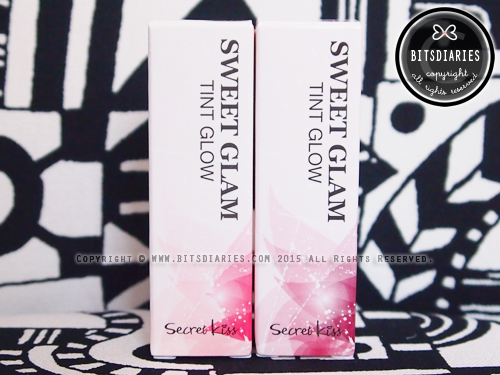 Secret Key Secret Kiss Sweet Glam Tint Glow~ I did a review on the shade Chic Burgundy the other day and here's the review on the shade Baby Pink. P.S. : Both Chic Burgundy and Baby Pink are from the same product range. Apart from the color, they have identical features so if you find the content of the review of Baby Pink similar to the review of Chic Burgundy, please excuse it. Let's set that aside, ... moving into the HAUL! 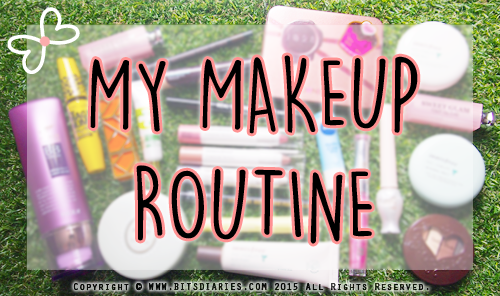 — 2015 April to June HAUL~! I have bought quite a handful of stuff in this few months so yeah... let's get started~! Anyway, as per request, I have updated and re-published My (past) Acne Story with more details and pictures. Looking for an effective deodorant to combat the sweat and odor in the summer? 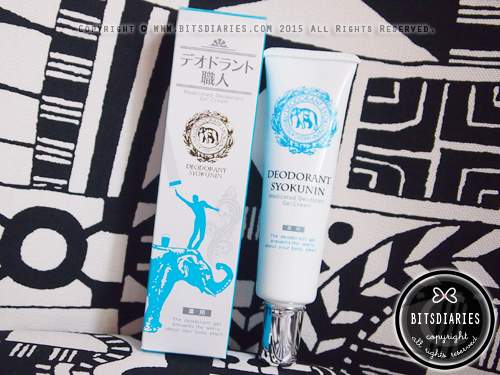 You gotta try 『薬用デオドラント職人』(Syokunin Medicated Deodorant Gel Cream)! As I reside in 365-days hot and humid country — Singapore, I'm always searching for a good deodorant. So months ago, in Japan, I picked up this deodorant and I'm amazed by how effective it is! 『薬用デオドラント職人』(Syokunin Medicated Deodorant Gel Cream) is a Japan's product and is available in Scented (citrus) and Unscented. Alive Museum — An interactive illusion art museum brought ALIVE from Korea. I believe it is a widely known attraction to most singaporeans. If you haven't heard of it, well, it is a museum filled with 3D, digital and object artworks that create visual illusions to trick your eyes. So what you see kinda comes to life! What's more, it's a place where you can hop into the frame and become a part of the masterpieces! If you are a regular reader of my blog, this product may be well-known to you as I have been raving it since Year 2013 and also did a review which can be read here. But if you are new to my blog and haven't heard of this product, continue to read on because I'm going to re-introduce this product (summarize version) and you will be amazed on what it does. 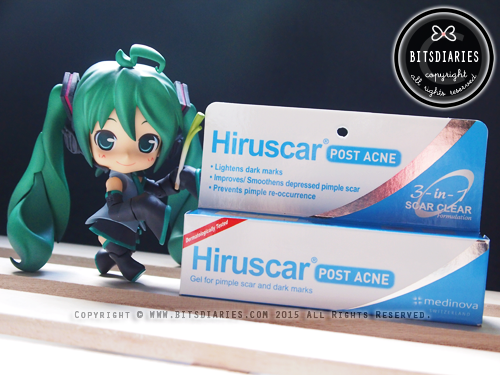 For readers who don't know what is Hiruscar® Post Acne Gel, it is an anti-bacterial, clear gel that is specialized in treating post acne marks/scars. 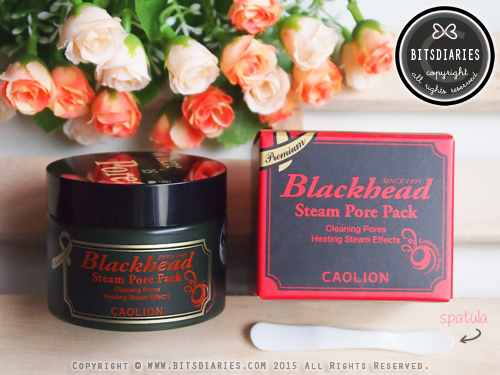 Ideal for oily and acne prone skin and best suitable for age between 15 to 24 years old. Is this brand logo familiar to you? Ever heard of it? If you don't, well, let me give you some insight on the brand Palmer's! Founded in America more than 170 years ago in 1842, Palmer’s has become one of the world’s leading names in skincare, a brand that women around the world have grown up with. Their unique heritage and commitment to quality has stood the test of time. Generations of families have loved the fantastic moisturizing qualities of Palmer’s skincare range, and millions of women around the world agree. Palmer’s can be found in bathroom cabinets in the homes of families in more than 80 countries, making it one of the popular skincare brand. Today, Palmer’s is still committed to creating affordable products that really do work, growing to provide a Palmer’s product for every skincare need : hand and body care, facial care, stretch mark care, hair care, body care and personal care. Using nature’s richest, most luxurious ingredients, Palmer’s key ingredients include Cocoa Butter, Shea Butter, Extra Virgin Olive Oil, Palmer’s has created a Palmer’s product for every skincare need. Palmer’s is against animal testing and all of the products are cruelty free. Majority of Palmer’s products are free of parabens, phthalates and sulphates.